Meteor House » Announcing Meteor House Chapbook No. 3! Announcing Meteor House Chapbook No. 3! Meteor House and Frank Schildiner are pleased to present Watch Your Back, Mr. Minamoto, a tale of suspense, action, and ancient horror! On the trail of professional assassin Igor Dragomiloff, grandson of the legendary master of the Assassination Bureau Ltd., Minamoto seeks to stop his foe from accessing an ancient evil: the secret knowledge of an ancient tribe of cannibalistic killers who worship long-forgotten gods. But is protecting the world the enigmatic Japanese man’s only motivation? The answers lay within Watch Your Back, Mr. Minamoto! Our third limited edition chapbook is a 24 page, 9,750 word, adventure signed by Frank Schildiner. And for our regular customers we have an added bonus: if you have preordered either of our forthcoming titles, this chapbook has free shipping (and will be sent to you, along with your other book(s), after FarmerCon in late July). 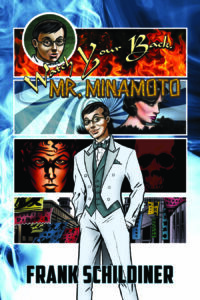 You can purchase Watch Your Back, Mr. Minamoto for only $8! But, if you have NOT preordered either of the above books, additional postage costs will apply. Comments Off on Announcing Meteor House Chapbook No. 3!